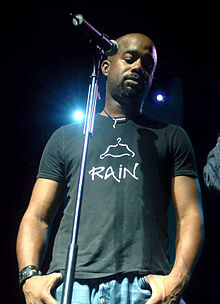 Darius Carlos "Hootie" Rucker (born May 13, 1966) is an American singer and songwriter. He first gained fame as the lead vocalist and rhythm guitarist of the Grammy Award-winning American rock band Hootie & the Blowfish, which he founded in 1986 at the University of South Carolina along with Mark Bryan, Jim "Soni" Sonefeld and Dean Felber. The band has released five studio albums with him as a member, and charted six top 40 hits on the Billboard Hot 100. Rucker co-wrote the majority of the band's songs with the other three members. He released a solo R&B album, Back to Then, in 2002 on Hidden Beach Recordings but did not chart any singles from it. Six years later, Rucker signed to Capitol Nashville as a country music singer, releasing the album, Learn to Live that year. Its first single, "Don't Think I Don't Think About It", made him the first black artist to reach number one on the Hot Country Songs charts since Charley Pride in 1983. (Ray Charles hit number one in March 1985 in a duet with Willie Nelson with Seven Spanish Angels). It was followed by two more number one singles, "It Won't Be Like This for Long" and "Alright" and the number three, "History in the Making." In 2009, he became the first black American to win the New Artist Award from the Country Music Association, and only the second black to win any award from the association. A second album, Charleston, SC 1966, was released on October 12, 2010. The album includes the number one singles, "Come Back Song" and "This". Darius Carlos Rucker was born and raised in Charleston, South Carolina, where his family history goes back generations. He lives in Charleston with his wife and three children. His single mother, Carolyn, a nurse at Medical University of South Carolina, raised him with his three sisters and two brothers. According to Rucker, his father was never around, and Rucker saw him only before church on Sundays. His father was in a gospel band called The Rolling Stones. Rucker has said that he had a typical Southern, African-American upbringing. His family attended church every Sunday and was economically poor, and at one point, his mother, her two sisters, his grandmother and 14 children were all living in a three-bedroom house. But he says that he looks back on his childhood with very fond memories. His sister, L'Corine, recalled that singing was always his dream. Rucker has been the lead singer of Hootie & the Blowfish since its formation in 1986. He met fellow band members Mark Bryan, Jim "Soni" Sonefeld, and Dean Felber while attending the University of South Carolina. Bryan heard Rucker singing in the shower, and the two became a duo, playing R.E.M. covers at a local venue. They later recruited Felber and finally Sonefeld joined in 1989. As a member of Hootie & the Blowfish, Rucker has recorded six studio albums: Cracked Rear View – 1994, Fairweather Johnson – 1996, Musical Chairs – 1998, Scattered, Smothered & Covered – 2000, Hootie & the Blowfish and Looking for Lucky – 2005, also charting within the top 40 of the Billboard Hot 100 six times. All six albums feature songs that Rucker, Bryan and Felber wrote. As the frontman, Rucker began to be called simply "Hootie" in the media, though the band title combines the nicknames of his college friends. Before his rise to fame, he lived in the basement of the Sigma Phi Epsilon house at the University of South Carolina, attempting to launch his career through the college bar scene. Rucker's signature contribution to the band is his baritone voice, which Rolling Stone has called "ingratiating," TIME has called "low, gruff, charismatic," and Entertainment Weekly has characterized as a "barrelhouse growl." Rucker said they "flipped" the formula of the all black band with a white frontman, like Frank Sinatra performing with Count Basie. Musically, he has sometimes been criticized or spoofed for not being "black enough". Saturday Night Live ran a sketch of Tim Meadows playing Rucker leading beer-drinking, white fraternity members in a counter-march to Louis Farrakhan's Million Man March. He also received death threats for singing the Hootie song "Drowning," a protest song against the flying of the Confederate flag above the South Carolina statehouse. Shortly after gaining a measure of fame, Felber and Rucker (who consider themselves best friends) moved into an apartment in Columbia, South Carolina. With Rucker's recognition as the frontman of a successful band came increased opportunities. In October 1995, he was asked to sing the national anthem at the World Series. Frank Sinatra invited him to sing at his 80th birthday party; he sang "The Lady Is a Tramp." That same week, he made a voice cameo in an episode of the sitcom Friends. He also joined Nanci Griffith on the song "Gulf Coast Highway" for her 1997 album Blue Roses from the Moons, and sang backing vocals on Radney Foster's 1999 album See What You Want to See. He encouraged Atlantic Records to agree to a deal with Edwin McCain and made a guest appearance on McCain's debut album, Honor Among Thieves. In regard to the future of Hootie & the Blowfish, Rucker was quoted by CBS news as stating in late 2011, "I don't think we'll ever break up totally. We're Hootie & the Blowfish. ... We'll make another record and do another tour someday. I don't know when, but it will happen. There's one more in us." Rucker appeared on a pop-star edition of the quiz show Who Wants to Be a Millionaire? in July 2001. He also portrayed a singing cowboy in a television commercial for the fast-food company Burger King, promoting its TenderCrisp Bacon Cheddar Ranch sandwich in 2005. In the commercial, he sang a jingle set to the tune of "Big Rock Candy Mountain." In 2006 Rucker lent his voice to the track "God's Reasons" written by Dean Dinning and Joel A. Miller for the film The Still Life. In early 2008, Rucker signed to Capitol Records Nashville as the beginning of a career in country music. His first solo single, "Don't Think I Don't Think About It" (which he co-wrote with Clay Mills) debuted at No. 51 on the Billboard Hot Country Songs charts for the week of May 3, 2008. It is the first single from his second album, Learn to Live. For this album, Rucker worked with Frank Rogers, a record producer who has also produced for Brad Paisley and Trace Adkins. Rucker also made his Grand Ole Opry debut in July 2008. The single reached number one in September, making Rucker the first solo, African-American artist to chart a number one country hit since Charley Pride's "Night Games" in 1983. Learn to Live was certified gold by the Recording Industry Association of America (RIAA) on February 6, 2009 and received a platinum certification on August 7, 2009. The album's second single, "It Won't Be Like This for Long", spent three weeks at the top of the country chart in mid-2009. Its follow-up, "Alright", became Rucker's third straight No. 1 hit, making him the first singer to have his first three country singles reach No. 1 since Wynonna in 1992. The album's fourth single, "History in the Making" was released in September and peaked at NO. 3. The singles also crossed over to the Billboard Hot 100, peaking at 35, 36, 30 and 61. "You see a lot of people doing a one-off, saying, 'This is my country record.' But this is a career I'm trying to build. The people that say that they don't get it, I'll let the music speak for itself. I plan to do a lot of country records." Rucker's entry into the country world was met with some intrigue, largely because of his history as a rock musician and because he is African-American. Billboard magazine said that "there's a sense of purpose that makes Rucker feel like a member of the country family, rather than calculating interloper." Rucker made visits to various country stations around the United States, explaining that he was aware that he was the "new kid on the block." Mike Culotta, the program director of Tampa, Florida, radio station WQYK-FM expected that Rucker would be "somebody who would have entitlement," but instead said that "Darius engaged everybody." When Rucker found that "Don't Think I Don't Think About It" went to number one, he cried. On November 11, 2009, Rucker won the Country Music Association New Artist of the Year award (formerly known as the Horizon Award), making him the first African American to do so since the award was introduced in 1981. Only one other African American has won at the CMAs: Charley Pride, who won entertainer of the year in 1971 and male vocalist in 1971 and 1972. Rucker released his second country album, Charleston, SC 1966, on October 12, 2010. The title is inspired by Radney Foster's solo debut album, Del Rio, TX 1959. Its first single was "Come Back Song," which Rucker wrote with Chris Stapleton and Casey Beathard. It was his fourth country number one as well as a NO. 37 hit on the Hot 100. The album's second single was "This", which was released to radio in November 2010 and also reached No. 1 in the country chart. Rucker wrote it with Rogers and Kara DioGuardi. "I Got Nothin'" was the album's third single, peaking at No. 18. Also included on the album is a duet with Brad Paisley titled "I Don't Care". Charleston, SC 1966 received a gold certification. On May 20, 2011, Rucker delivered the commencement address to the graduating class of the Medical University of South Carolina. On December 14, 2011, CBSnews.com reported that Rucker was working on a third country album with recording set to begin January 2012 followed by the release of the album early in the year. The album's lead-off single, "True Believers," made its chart debut in September. On October 12, 2012, Rucker told Broadway's Electric Barnyard that his album would also be titled True Believers. "True Believers" peaked at No. 18. Its second single is a cover of Bob Dylan and Ketch Secor's "Wagon Wheel" (previously made famous by Old Crow Medicine Show), featuring backing vocals from Lady Antebellum. "Wagon Wheel" reached No. 1 on the Country Airplay chart in May 2013. True Believers was released on May 21, 2013. The album's third single, "Radio", was released to country radio on July 22, 2013. The album's fourth single, "Miss You", was released to country radio on February 3, 2014. On October 2, 2012, Rucker was invited to join the Grand Ole Opry. Halfway through his set at the Opry that night he answered questions from the audience which included a question from Brad Paisley. Paisley said: "I have two questions. One, are you still the worst poker player in the world? And two, would you like to become the newest member of the Grand Ole Opry?" Rucker accepted, and it became official on October 16. Rucker was a featured performer at the C2C: Country to Country festival in London on March 17, 2013, which was headlined by Carrie Underwood. On News Year's Day 2013. he sang the national anthem at the Outback Bowl in Tampa, Florida. On May 11, 2013, Rucker was the speaker at the commencement ceremony for the University of South Carolina in Columbia. Before his speech, he received an honorary doctorate of music. Rucker also sang the national anthem at the NBA finals on June 16, 2013. On December 6, 2013, it was announced that Rucker's version of Wagon Wheel had earned him a nomination for Best Country Solo Performance for the 56th Annual Grammy Awards. At the awards ceremony on January 26, 2014, Rucker won, becoming only the third African American recording act (the first being Charley Pride, the second being The Pointer Sisters) to win a vocal performance Grammy Award in a country music category. On August 25, 2014, Rucker released a new single titled "Homegrown Honey" to country radio and to digital retailers. It served as the lead single to his fourth country studio album, Southern Style, released on March 31, 2015. It reached No. 2 on the Country Airplay chart in April 2015. The album's second single, the title track, released to country radio on May 4, 2015. On September 15, 2014, it was announced that Rucker had completed his first Christmas album and that it would be released on October 27, 2014. Included is a collaboration with Sheryl Crow on "Baby, It's Cold Outside". May 30, 2015 Rucker headlined Philadelphia's infamous XTU 31st Anniversary Show at the Susquehanna Bank Center. Rucker makes an appearance on Sister Hazel's new album, Lighter in the Dark. On January 6, 2016, Rucker announced that he is working on his fifth country album. The album's lead single, "If I Told You" was released to country radio on July 5, 2016. On May 29, 2016, Rucker performed the national anthem prior to the 100th running of the Indianapolis 500. Rucker also performed the national anthem for a game between the Buffalo Bills and the New York Jets on September 15; although Rucker is a well-known Miami Dolphins fan, Rucker agreed to perform the song at the behest of personal friend and former Bills player Bruce Smith, whose jersey was being retired that night. He was selected as one of 30 artists to perform on "Forever Country", a mash-up track of "Take Me Home, Country Roads", "On the Road Again" and "I Will Always Love You", which celebrates 50 years of the CMA Awards. In 2017, he will return to Europe as part of the C2C: Country to Country festival where he previewed the song "First Time" from his upcoming album. Rucker is an ardent South Carolina Gamecocks fan as well as a Miami Dolphins and Cincinnati Reds fan. He also likes the film Stir Crazy, which he has seen more than 100 times. Rucker's mother died in November 1992 of a heart attack. His grief inspired two Hootie & the Blowfish songs: "I'm Goin' Home" and "Not Even the Trees." On April 21, 1995, his girlfriend gave birth to Rucker's first child, Carolyn Pearl Phillips. His second daughter, Daniella Rose, was born to his wife, Beth, on May 16, 2001. They had a son, Jack, in 2005. The Hootie song "Where Were You" is about Rucker's strained relationship with his father, and was released only in Europe, where Rucker thought that his father would be unlikely to hear it. His country single "Alright" was inspired by his marriage. Rucker is a friend of the golfer Tiger Woods, whom he met in a bar when Woods was 18. Rucker sang at the golfer's wedding with Hootie & the Blowfish and at his father's funeral. His interest in golf goes well beyond his relationship with Woods; he was a VIP guest of Team USA at the 2016 Ryder Cup, and he attended Arnold Palmer's funeral shortly before the Cup. In North Charleston, South Carolina, a street is named Darius Rucker Boulevard after him. On November 7, 2016, Rucker told ESPN that he had become a partner in MGC Sports, a sports agency that currently represents golfers (among them Steve Stricker and Kenny Perry), football players, and coaches. He added that he was planning to reduce his performance commitments from 100 dates per year to about 30, and that he thought that his experience in the entertainment business would be an asset to potential clients. Rucker will be able to work without restrictions for golfers, but because he is not registered with the NFL players' union, he initially will only be able to meet with NFL players under very limited circumstances. For the Undercover Boss series episode "Celebrity Undercover Boss: Darius Rucker" which premiered May 12, 2017, Rucker disguised himself as a 62 year old music teacher, ran an open mic night and worked as a roadie. ^ Leahey, Andrew. "Darius Rucker". Allmusic. Retrieved October 24, 2015. ^ "Hootie & the Blowfish chart history". Allmusic. Retrieved 22 November 2010. ^ See What You Want to See (CD insert). Radney Foster. Arista Records. 1998. 18833. ^ a b Moraski, Lauren (14 December 2011). "Darius Rucker to release new country album in early 2012". CBSnews. Retrieved 9 January 2012. ^ a b Wilson, MacKenzie. "Darius Rucker biography". Allmusic. Retrieved 2008-05-07. ^ a b Cordova, Randy. "10/15: Darius Rucker talks State Fair, Hootie reunion." The Arizona Republic. Oct. 15, 2014. ^ Duncan, Apryl (2005-03-07). "Yes, that's Hootie crooning for Burger King. In 1999, he sang "War" at the Bob Marley All-Star Tribute.". About.com. Retrieved 2008-06-10. ^ Taylor Jr., Otis R. (19 September 2008). "Hootie's Darius Rucker not just a rocker gone country". PopMatters. Retrieved 22 November 2010. ^ "Darius Rucker Basking in Country Success". GAC. 2008-07-23. Archived from the original on 2008-08-13. Retrieved 2008-08-24. ^ C., Matt (2008-08-13). "Rucker Proves That Sometimes, The Best Marketing Is No Marketing At All". Engine 145. Archived from the original on 2014-08-21. Retrieved 2008-08-24. ^ Caulfield, Keith. "Metallica Holds At No. 1, Ne-Yo Arrives In Second ". Billboard. September 24, 2008. Retrieved 23 November 2010. ^ Guerra, Joey (13 March 2009). "Darius Rucker thrilled to be living his dream". The Houston Chronicle. Retrieved 22 November 2010. ^ "RIAA – Gold & Platinum". Recording Industry Association of America. Retrieved 2009-09-18. ^ Trust, Gary (2009-08-05). "Chart Beat: Darius Rucker, Mariah Carey, Brad Paisley, Wilco". Billboard. Retrieved 2009-08-06. ^ a b "Darius Rucker Album & Song Chart History – Country Songs". Billboard. Retrieved September 14, 2010. ^ a b "Darius Rucker Album & Song Chart History – Hot 100". Billboard. Retrieved September 14, 2010. ^ No byline (September 23, 2008), "Hootie's Rucker tops country chart". USA Today. ^ Lapowsky, Issie (12 November 2009). "CMA's underdog: Darius Rucker of Hootie and the Blowfish, first black to win best new artist". NY Daily News. Retrieved 21 November 2010. ^ "Darius Rucker shoots for country milestone". Msnbc.com. 11 November 2009. Retrieved 21 November 2010. ^ "Darius Rucker Schedules New Album, Charleston, SC 1966, for Oct. 12". CMT. 16 July 2010. Retrieved 22 August 2010. ^ Shelburne, Craig (8 June 2010). "Darius Rucker Sings a Groovy "Come Back Song"". CMT. Retrieved 22 August 2010. ^ Cheung, Nadine (8 November 2010). "Darius Rucker — "This"". AOL Radio Blog. Retrieved 21 November 2010. ^ Erlewine, Stephen Thomas. "Charleston, SC 1966 review". Allmusic. Retrieved 27 September 2012. ^ Hettiger, Laura (2011-05-20). "Darius Rucker celebrates MUSC's graduation". Retrieved 2015-05-23. ^ "Broadway's Electric Barnyard". Broadwayselecttricbarnyard.com. Archived from the original on 2014-02-01. Retrieved 2013-05-21. ^ West, Kay (2013-01-14). "Brad Paisley Surprises Darius Rucker – with Grand Ole Opry Honor - Nashville, Music News, Brad Paisley, Darius Rucker". People.com. Retrieved 2013-05-21. ^ "Tim McGraw, Carrie Underwood Set to Headline London's First-Ever Country to Country Music Festival". Taste of Country. 10 December 2012. Archived from the original on 11 December 2012. Retrieved 11 December 2012. ^ Stefano, Angela (January 13, 2015). "Darius Rucker Reveals New Album Details, 2015 Southern Style Tour Plans". The Boot. Retrieved January 13, 2015. ^ Despres, Tricia. "Darius Rucker just turned in a stunning, Indy 500 rendition of "The Star Spangled Banner"". rare.us. Cox Media Group. Retrieved 29 May 2016. ^ a b Rovell, Darren (November 7, 2016). "Darius Rucker of Hootie and the Blowfish joins sports agency". ESPN.com. Retrieved November 7, 2016. ^ Bonnie Bolden (May 8, 2017). "Darius Rucker scouts La. man on 'Undercover Boss'". The News-Star. Retrieved May 12, 2017.